The rash caused by Lyme disease, known as Erythema migrans. Or some creepy Target ad placement. Lyme disease (so named for the town in Connecticut , where researchers discovered it while investigating why the hell so many people from there and the neighboring town of Old Lyme were getting what appeared to be rheumatoid arthritis) is an infectious disease carried by certain types of ticks, especially deer ticks. The disease is caused primarily by the bacteria Borrelia burgdorferi in the United States, and by B. afzelii and B. garinii in Europe. Symptoms include headache, fever, fatigue, and a distinctive rash. Diagnosing Lyme disease without a visible rash can be confirmed by performing tests known as an ELISA and a Western blot, though this is not recommended for those with non‐specific symptoms like chronic fatigue. Because doctors only recently discovered it in 1977, Lyme is not as well understood as other diseases. This leaves it rife with woo. When Europeans first came to the United States it was rampant, among them and the Indians who lived in or near forests. Accounts of North America dating back to the 1700s clearly describe its hallmark symptoms, and as early as 1762 a Scottish doctor managed to connect them to the presence of ticks. As colonists deforested large swathes of the eastern United States it became far less frequent, as ticks no longer had much in the way of habitat. When much of this area, especially New England, subsequently became reforested, the disease accordingly made a significant comeback. Early stage Lyme disease is treated with oral antibiotics for 2–3 weeks. Lyme disease diagnosed at a later stage is treated with intravenous antibiotics for 2–4 weeks. Some research suggests that a single dose of antibiotics within 72 hours of being bitten can prevent development of Lyme disease, though cost‐effective analysis demonstrates that this prophylactic treatment is suitable for only those with a high risk of Lyme disease. Thus the Infectious Diseases Society of America (IDSA) recommends it only for those living in areas where the infection rate in ticks is greater than 20%. LYMERix, a vaccine for Lyme disease was licensed by SmithKline Beecham in 1998, but withdrawn from the market in 2002. Pasteur Mérieux Connaught separately developed a Lyme disease vaccine, but decided not to market it even though it was shown to be efficacious in a Phase III clinical trial. LYMERix, though not a perfect vaccine was effective and had relatively few side effects. This timing for the release of the vaccines was unfortunate because it coincided with the rise of anti-vaccine hysteria that was brought on by the discredited 1998 study of Andrew Wakefield. Like most diseases, Lyme disease has a number of alternative cures that can range from ineffective to dangerous. Bismacine, sometimes known as Chromacine, is an injection containing the metal bismuth. The American Food and Drug Administration has put out a warning on Bismacine, which has not been shown to help with Lyme disease and can lead to heart and kidney problems. Colloidal silver is the suspension of silver particles in water and can be taken either topically (on the skin) or orally. It has shown no efficacy as an antibacterial inside a living body, and can lead to Smurfism a bluish discoloration of the skin called argyria and possible kidney damage. Hydrogen peroxide injections can lead to death, and are not recommended by the IDSA. Hyperbaric oxygen therapy is the practice of subjecting a patient to a large amount of oxygen. It is not recommended by the IDSA. NASA also recommends avoiding this so-called treatment, and has done so since shortly after the conclusion of the Apollo 1 mission. Malariotherapy involves purposely infecting the patient with malaria through an injection of infected blood, in the belief that the high fever will kill the bacteria (first proposed by Henry Heimlich, creator of the Heimlich maneuver). This is strongly discouraged by the Centers for Disease Control (CDC) and the IDSA. About 15% of those undergoing normal antibiotic treatment experience pains and fever within the first 24 hours of treatment because of the Jarisch–Herxheimer Reaction, where the death of bacteria can release toxins faster than the body can handle them. However, some (a.k.a. those who don't listen to standard medical advice) believe that they have "herxes" weeks after antibiotics are finished, that they "herx" cyclically for weeks at a time, or that "herxing" is necessary and should be evident in all treated cases. Symptoms occurring over 24 hours after initial treatment are not a Herxheimer Reaction. These misconceptions stem from a misguided belief that antibiotics are supposed to make a patient feel worse if they are working. As a result, "herxing" people often do not get their Lyme‐unrelated symptoms checked out and continue to suffer unnecessary pain. A small portion of those who undergo regular antibiotic treatment for Lyme disease suffer muscle aches, pains, and fatigue after their treatment is finished. Many of them believe this is because of "chronic Lyme disease", a persistent infection of Lyme spirochetes that either survived antibiotic treatment or was originally misdiagnosed. However, the Infectious Diseases Society of America, the Centers for Disease Control, the National Institute of Allergy and Infectious Diseases (run by the National Institutes of Health), and the American Academy of Neurology all agree that there is no such condition as "Chronic Lyme disease." Lest one think this list US‐specific, this claim is supported by the European Federation of Neurological Societies, the European Union of Concerted Action on Lyme Borreliosis, the Canadian Public Health Network, and the German Society for Hygiene and Microbiology. Dr. Allen Steere, the original discoverer of Lyme disease, disputes the existence of the condition. A study of those claiming Lyme disease persistence after an antibiotic course found no traces of B. burgdorferi in any of the subjects. Others who claim to be infected have no evidence of having "regular" Lyme disease in the first place. Diagnosis is made by "Lyme-literate" doctors, and testing for the disease is often performed by Lyme-specific laboratories that do not follow evidence-based guidelines. One Lyme-literate lab has a 25% positive rate – the average national rate is 8%. People who believe they have a chronic infection often take antibiotics for a long period of time in order to fight the infection; there is no evidence to show that this helps with the symptoms and plenty of evidence that it is harmful, both to the patient and to the general populace. Use of antibiotics for as little as ten weeks (still over twice the recommended time for treatment) can allow drug-resistant bacteria to develop, infect, and kill a patient. On the other hand, there is evidence to support the idea that some symptoms do linger past initial treatment of Lyme disease, in what the IDSA and others term "post–Lyme disease syndrome" (though due to the IDSA guidelines being relatively new, the term "chronic Lyme disease" is occasionally used to mean this syndrome). However, it's important to note that, as stated above, there is no evidence of Lyme disease–causing bacteria in patients with this syndrome, and long-term antibiotic treatments are still not recommended. While the exact cause of post–Lyme disease syndrome is unknown, some medical experts, such as Dr. Steere, believe that these symptoms are the result of autoimmune-related effects of the B. burgdorferi spirochete. There is preliminary evidence to support this hypothesis. Scientists have discovered a new tick that causes similar symptoms to lyme disease and is antibiotic resistant. Be aware that this is not confirmed yet. Do not jump to conclusions. In 2008, Connecticut Attorney General Richard Blumenthal (he of "When I served in Vietnam" fame a few years later, and US Senator as of 2011) launched an anti-trust investigation of the IDSA for not citing (non‐existent) evidence about chronic Lyme disease in its 2006 guidelines. Blumenthal's office ordered the IDSA to create a new panel with an independent head to evaluate the original guidelines. In 2010, the new panel unanimously upheld the 2006 guidelines. Pennsylvania bill SB 1199 proposed the construction of a Lyme-disease task force. The composition of the task force would have included two physicians, both of whom are required to be members of the International Lyme and Associated Diseases Society, a large proponent of chronic Lyme disease. This is despite the organization being cited by the Pediatric Infectious Disease Journal as a source of inaccurate information (ranking either "inaccurate" or "not found" in every one of their categories). The bill is, as of January 2011, still pending. Massachusetts and Connecticut passed laws, in 2010 and 2009 respectively, protecting the rights of physicians to prescribe long‐term antibiotics to fight "chronic Lyme disease." Rhode Island and California have similar laws, and Minnesota dropped its legislation after the state medical board lost its professional dignity agreed to put a five-year ban on investigating doctors who treat "chronic Lyme disease" without the board first receiving a specific complaint from a patient. The western fence lizard (Sceloporus occidentalis, known as blue-bellies) have an anti-lyme disease protein in their blood. If a tick nurses on the lizard, it won't have lyme disease. Because Lyme disease was discovered relatively recently, there are some who believe Lyme is either a man-made disease or a genetically engineered version of an older form. Most of these claims center around the Plum Island Animal Disease Center in New York, and many of them come from the website of bullshitter extraordinaire Jeff Rense. Like other conspiracy theories, claims abound that there's a government cover-up involving murder, or that there's a Hitler/Nazi/Third Reich connection. Why the US government would invest so much money in a disease that mostly affects US citizens and rarely causes death is unknown. Lyme disease has also been claimed to have connections to Morgellons disease and autism (the fact of which Big Pharma obviously doesn't want you to know). 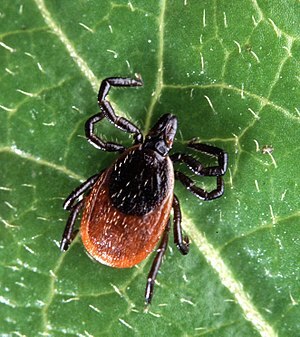 ↑ Prophylaxis with single‐dose doxycycline for the prevention of Lyme disease after an Ixodes scapularis tick bite. ↑ Prevention of Lyme disease after tick bites. A cost‐effectiveness analysis. ↑ 6.0 6.1 The History of the Lyme Disease Vaccine (Last update 17 January 2018) The History of Vaccines. ↑ 7.0 7.1 The incredibly frustrating reason there’s no Lyme disease vaccine: Your dog can get vaccinated for Lyme. You cannot. by Brian Resnick (May 7, 2018, 12:20pm EDT) Vox. ↑ Vaccines against Lyme Disease: What Happened and What Lessons Can We Learn? by Gregory A. Poland (2011). Clinical Infectious Diseases 52(Suppl. 3): s253–s258. ↑ Advertises colloidal silver to people who believe they have "chronic Lyme disease"
↑ Morgellons – New Disease, or Man‐Made Weapon of Terror? This page was last modified on 16 February 2019, at 03:06.